Nathaniel will be joining us this summer in 42nd Street as Billy Lawlor. 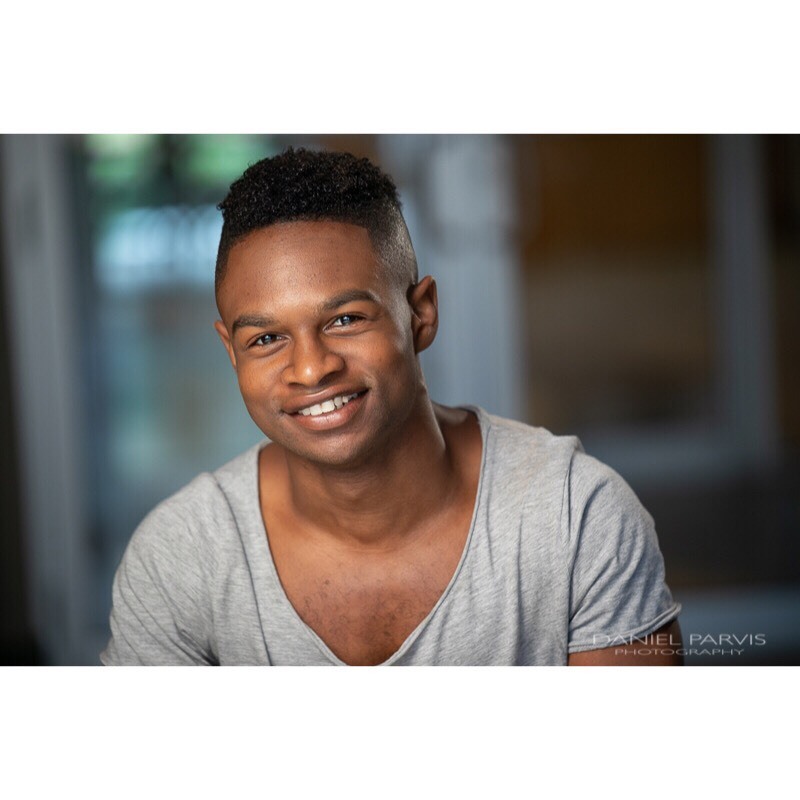 Not only does Nathaniel have experience performing for America's oldest and largest outdoor musical theatre, The Muny, but he also brings a joy and daring to performance that is rare to find. Work with Nathaniel and find out for yourself in 42nd Street this summer. Q. When did you first encounter performance? What hooked you? A. "So I actually was a little bit of a late bloomer. When I was younger I participated in a few small acting/modeling events for kids but never started pursuing the actual career until I started doing theater and show choir in high school. As a kid growing up, sports were a big chapter in my life. As I got older I started to notice how well I could dance I was invited to audition for the summer musical early high school. Dancing has always been something that has come very natural to me. I started performing in front of crowds in high school for numerous events such as assembly, talent shows and especially in show choir. The first show I ever did was The Wizard of Oz. Since then, I have absolutely been hooked!" Q. What has been your favorite performance experience? A. "So far, my favorite performance experience has been performing on stage at The Muny in St. Louis. The Muny is well known for being one of the largest outdoor theatres in the country. I performed in The Wiz, so the style of dance was right down my alley. Contemporary, hip hop, and tap are my strongest styles. Camille A. Brown is such a great choreographer so representing her work on stage was really an amazing experience. also performing for 50,000 seats is near a bad thing I would say." Q. What has been your most challenging performance experience? A. "So far my most challenging experience has been was in I was in the play "A Nightingale for W.E.B. Dubois" by playwright and poet Femi Osofisan. In the show I had to play former president Osaygeyfo Kwame Nkrumah. The most challenging part of portraying a former president was playing an age far older than mine. I also had to speak with a Ghanaian Accent, which made it easier to get into character but always had me thinking and processing information through how I spoke. There was no dancing in the show so you can imagine I had to think of everything but dancing the entire time. What I do as a career keeps me learning and always discovering new parts of storytelling whether that be through song, acting or dance." Q. What do you do to prepare for auditions? A. "Normally when I am preparing for an audition I am constantly going over my material before the actual audition itself. Preparation is key to having a great audition, even if you don't book the role you know that you gave your best in the room toasts what truly matters. It helps to really go into the space and not have to worry about whether or not your material is good to go or can you just have a relaxing and enjoying time during your piece. I always think to myself before an audition, whoever is in the room wants me to do a great job too." Q. What is your favorite part about performing? A. "My favorite part about performing is that no matter how many times I sing the same song or piece it will never be the exact same as before. Being able to temporarily live in a new world to me is the best part about performing. Seeing the audience enjoying themselves or to be completely immersed into a live performance is the coolest thing about this job. It never gets old." Q. If you had any advice for yourself as a budding performer what would it be? A. "To myself I would say, never give up. This is not the easiest profession but the best thing you can do is try. I can be hard on myself at times when it comes to my work when in reality there is always an upside or a way to work around something. It would also tell myself to let people stand in the way or hold you back. Your greatest opponent can be self doubt. Positivity and faith can go miles." Do you want to work with Nathaniel J. Washington? Then register now for 42nd Street! 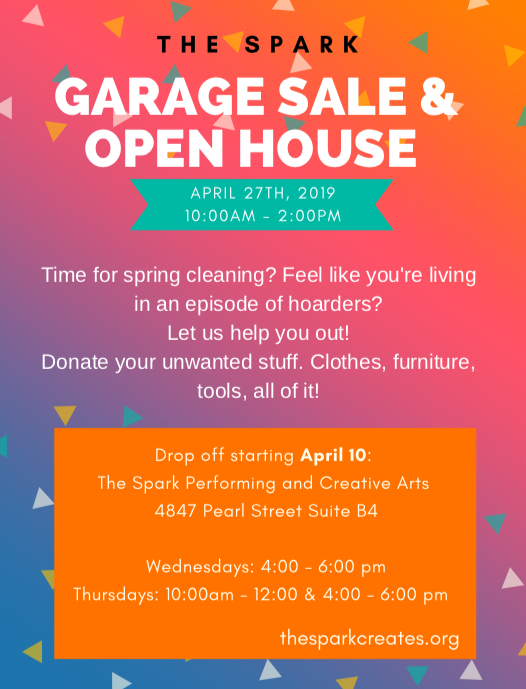 Looking for a way to get rid of that spring cleaning? 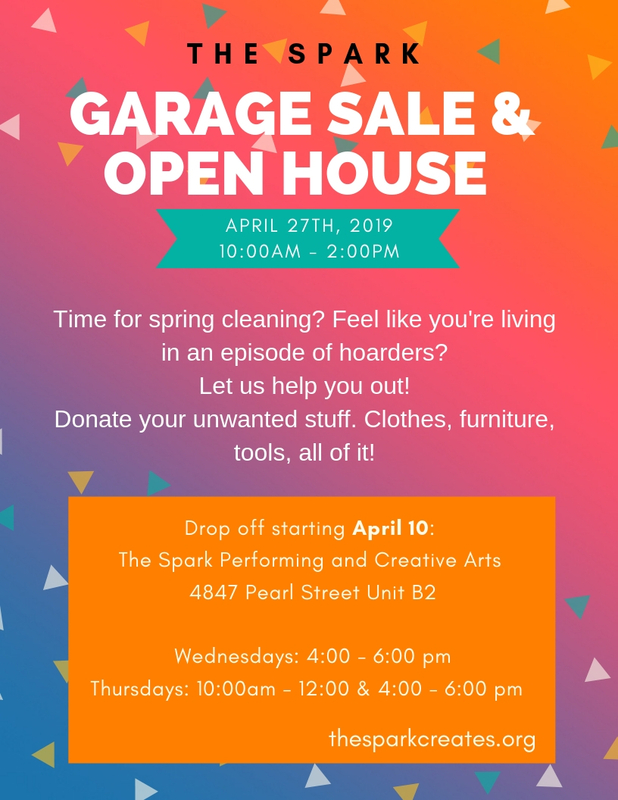 Give your unwanted goods to us! We will sell them at our Garage Sale on April 27th! We are taking donations during the week. Check out the flyer for details! Thanks for supporting the Spark! We are excited to continue this Spark tradition at Aperitivo Restaurant on April 12 at 6:30pm. Join us for an evening of Broadway songs and camaraderie! No cover cost! 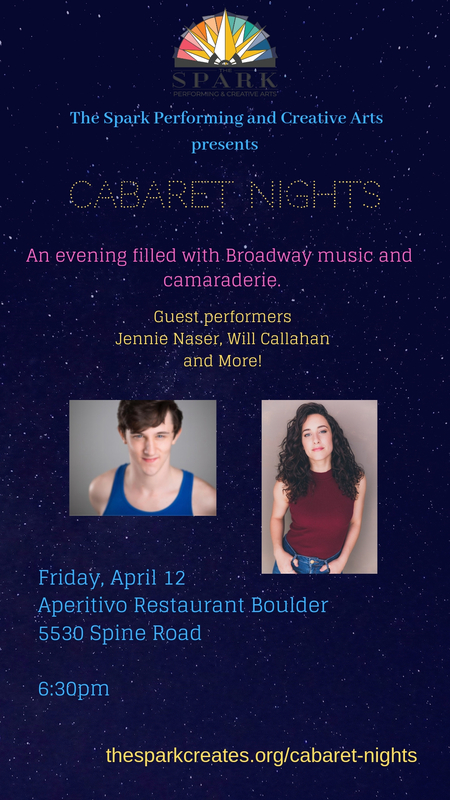 Special guest performers Jennie Naser, Will Callahan and our own Terri Schafer will be in town to perform and bring the night to life! Beast this summer at The Broadway Palm. the 2017 Broadway National Tour which he was nominated for a Broadway World Award for. The Spark begins our move-in process this Sunday, March 31st. We'll start by installing sprung floors, getting the theatre painted, and moving in some gifted furniture. After months of anticipation and preparation we can't wait to start making some magic in this building. We have been so grateful to work with our sponsor Arcadea Architecture on this project. After many planning sessions, changes, and inspirations, we have a plan that's ready to submit to the city for permitting. And although interior construction won't be fully completed until May, we are just too darn excited to show everyone our new home... we can't hold it in any longer! So, we're hosting an Open House as part of Boulder Arts Week to invite parents, students, artists, and community members to see what The Spark is all about. 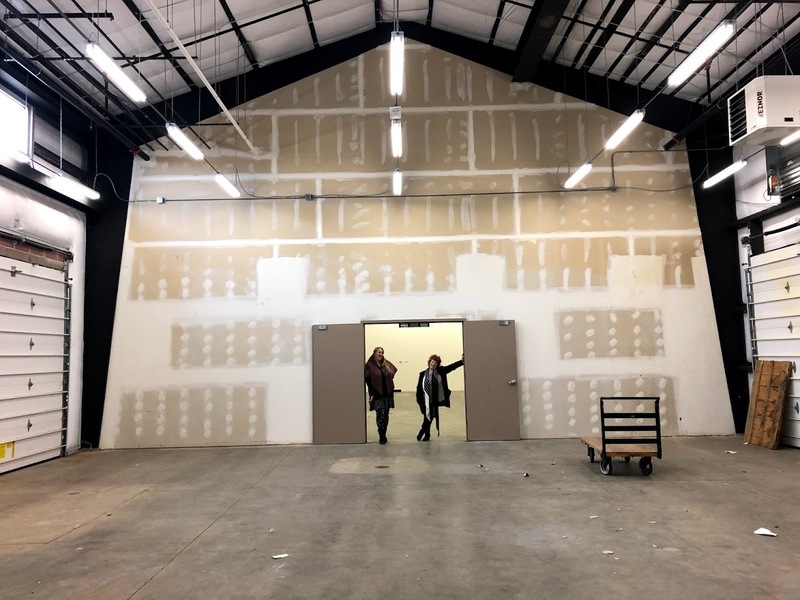 This is a chance to meet co-founders Dillon Kenyon and Marla Schulz, as well as tour the facility, and see renderings of what the space will look like once completed. On top of all that awesome, there will be food and drinks through donation. We hope this will be an opportunity to begin sharing a special space with the community. As much as it is our home, it's your home too. Join us Saturday, April 6th between 3:30-6:00 pm as we celebrate move in, and the people who contribute to the art of Boulder. A Chicago native, Tanya now lives in NYC working professionally as an actress and a singer. 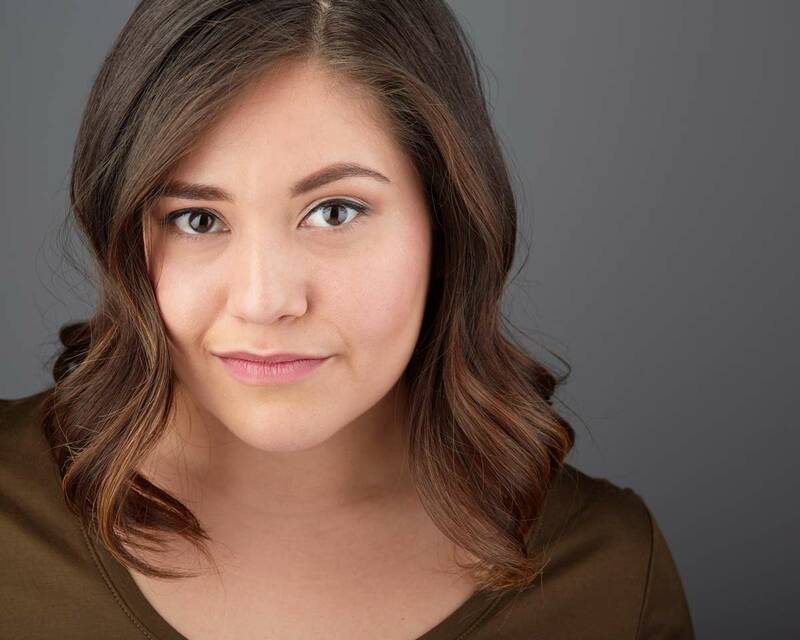 She'll be joining our production of Fame: The Musical this summer in the role of Serena Katz, and we couldn't be more excited to have her spirit and talent in this production. Read below to find out what we mean! Q.When did you first encounter performance? What hooked you? A. I first encountered performance as a kindergartner at our elementary school. My mom enlisted me to the Mexican folkloric Dance group and I participated in the program for 6 years. What really hooked me into musical theater was when I did Into The Woods in high school with the worst corn- yellow wig you could imagine. I heard Sondheim and from then on was stunned that we could sing and tell a story at the same time! ‍Q. What has been your favorite performance experience? A. My favorite performance experience has been when I did In The Heights Salgado Productions at Axelrod. It was the first show where I saw people that looked like me and sang like me portrayed in a positive light. So when I got the chance to do it, I did it with a full heart and lots of gratitude. A. My most challenging performance experience was when I worked on a cruise ship. Doing a show for 6 months straight without any covers/swings is challenging during a normal contract; now add 10ft waves and sea sickness and that makes it a tad more difficult. Throughout this contract, I learned a lot about how far I could push myself as well as how to listen to my body. Q.What do you do to prepare for auditions? A. My favorite part about performing is the rehearsal process. That is where I learn so much and when I get to play and discover the most. It's also very challenging, but man, when you nail that choreo in the room after failing at it for two hours---woooh is that such a rush of adrenaline! A. Don't try to be like anyone else. You are so special and no one can do you better than you. The casting directors don't want to see you be or sound like someone on the cast recording, if they did, they would just hire that person or listen to the album. Trust that who you are is enough and have fun in the room. Those 2 minutes that you have in the room are the 2 minutes that you get to perform that day so enjoy them! Do you want to perform and learn with Tanya this summer? Register now for Fame: The Musical.